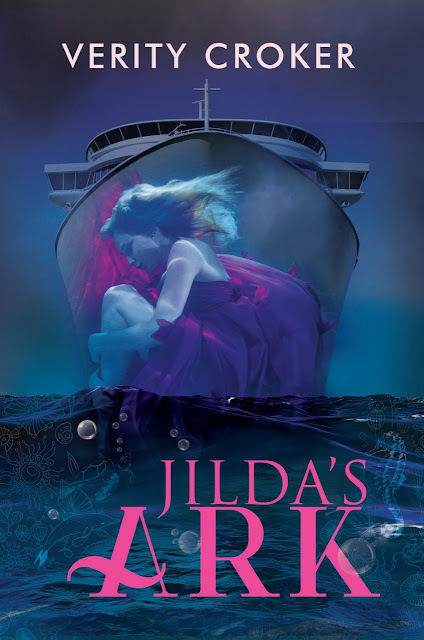 Hi, I'm Verity Croker and I'm really excited to be able to reveal the cover of my latest YA novel, Jilda's Ark, published by Harmony Ink Press. I hope you love the cover as much as I do! What was supposed to be a sixteenth birthday celebration cruise for identical twins Jilda and Rosa quickly turns into a nightmare. While her mother and sister are enjoying an excursion on a Fijian island, Jilda, who is unwell and remains onboard, finds their ship has sailed off, leaving most of its passengers stranded on shore. An unknown group has overtaken the ship. After a few days, they collect thousands of new passengers from a distant archipelago, making conditions onboard overcrowded and uncomfortable. Nobody seems to know where they are headed, so the mood on the ship rapidly deteriorates. Though Jilda is desperate to reunite with her family, she meets someone who comforts her and will completely change her world. But how will her new friend Jade feel when she learns Jilda has a boyfriend back home? “WHY DON’T you want to come with us, Jilda?” Mum calls to me from inside the cabin. She sounds worried. I’m leaning out over the veranda rail, gazing at the seemingly unspoiled island—one of the lesser-known islands of Fiji. Palm trees sway in the breeze, the white sand seems barely walked on, and the sun sparkles on the tropical turquoise ocean. I breathe the fresh air in deeply, trying to settle my stomach. I doubt it’s the food on the cruise ship that’s made me ill, and all I can think of is the street food I bought the other day in Tonga. The crab-cake burger tasted so delicious, but how long had the seafood been lying around in the tropical sun? Perhaps not such a great idea. I’ve been feeling off ever since, and I don’t think it’s just a bout of seasickness. I’ve been really looking forward to exploring Fiji, but I know I won’t be able to cope with the winding roads and long hours in the bus we’ve been warned of in the excursion details pamphlet. “I don’t like leaving you here on your own,” says Mum. “We’ll take lots of pics so you won’t feel you’ve missed out,” cries Rosa over her shoulder, and the heavy door swings firmly shut behind them with a click. “You can eat my share of lunch!” I call out to the closed door, though I know they probably won’t hear me. I turn to look at the view again, then after a few moments step back into the cabin and lie down on the bed. Because there are three of us, we have a suite, with a huge king-size bed in the bedroom and a sofa bed in the lounge room area. Rosa and I sleep on the large bed and Mum has the sofa bed. I lie on my back, diagonally across the bed, and sweep my arms and legs back and forth like you do to make snow angels. I’m enjoying having all this massive bed space to myself. My stomach starts to settle. While drifting off to sleep, I think about all the cool sights we’ve seen so far on the trip. Hopefully it’ll only be yesterday and today I feel unwell, as I really don’t want to miss out on any of the other islands. I remember us choosing the cruise itinerary months ago. After much discussion we decided on one that went from Sydney to islands including Samoa, Vanuatu, Tonga, and Fiji. Mum had long wanted to go to the Caribbean, especially to St. Lucia, Barbados, the Bahamas, and Jamaica, but with the international flights added, it would all be too exy. So she gave up on that idea and was content to let us decide where we wanted to go. The holiday is, after all, to celebrate our sixteenth birthdays. After poring over different cruise itineraries for hours and noting down the pros and cons of each—Rosa did a spreadsheet, would you believe—we decided something in the Pacific Ocean would be just as special. Rosa and I wanted our boyfriends, Zac (mine) and Andy (hers) to come on the trip too, but Mum and Dad both said that wasn’t going to happen. We’ll all celebrate together with a party at Zac’s parents’ place—they’ve got a huge house and garden—when we get home again. After a time I fall asleep, and when I finally awake, I have a vivid recollection of a dream in which I heard the familiar rising ding-ding-ding from the tannoy that heralds announcements, followed by the voice of the cruise director. I remember the lifeboat drill we had on the first afternoon we boarded the boat, with hundreds of passengers crowded into each muster station. I wondered then whether anyone would remember which muster station they were supposed to go to if there were a real emergency. Now fully awake, I have to immediately bolt to the bathroom and am so glad I opted to stay on board. It would’ve been so embarrassing having to ask the bus driver to stop in the middle of nowhere and run into the bushes with everyone knowing what I was up to. Sitting on the loo, I feel like I’m swaying and after a while I realize the ship must be sailing. That’s odd. Where are the others? I must have been asleep longer than I thought. Leaving the bathroom, I go out onto our balcony and see we’re indeed miles from shore. Fiji is just a small speck on the horizon. Weird. The others must be up by the pool or something, leaving me in peace. Back in the bedroom I glance at the bedside clock. It’s only 1:00 p.m. Why are we already at sea? I remember the day before yesterday when we were in Tonga. Some of the guests went on a day trip to the north of the island and the ship set sail and picked them up from there later in the afternoon. Perhaps that’s what they’re doing today too, and I didn’t take enough notice of the plan. I hop back into bed but can’t sleep. I feel uneasy and my dream has made me unsettled, so I get up, throw on some clothes and, after grabbing my ship’s key card, slip out of the cabin. The long, carpeted hallway stretches into the distance in either direction, and I glance both ways before deciding to go up to the pool. The hallway is eerily quiet. The space outside the lifts, where normally heaps of passengers congregate, as they are either too lazy or incapacitated to take the stairs, is empty. I take the stairs, as I always like to get a bit of built-in exercise whenever I can, and reach the pool deck. There’s no one dozing on the sun lounges, or aimlessly breaststroking up and down the length of the pool. Even the humongous guy who’s usually in the spa bath with the whole space to himself isn’t here! There are no waiters hovering round ready to deliver drinks or hand out towels either—that’s unusual. I remember my dream, so I wander down to the Vista Theater on deck five, directly under the pool deck, to see if maybe there really had been an announcement but I’d just been too sleepy to realize. There’s no one in the huge auditorium designed for a large audience. Suddenly I hear somebody behind me. Startled, I jump and turn around. A man I don’t recognize has come into the auditorium. His hands are shaking, and it’s all he can do to keep his voice steady. “I was asleep. I thought it was a dream. What’s going on?” My voice is shaking too. I feel tears spurt into my eyes, and quickly try to blink them away. I don’t want to cry in front of him. But I can’t help it. I want Mum…. Verity Croker writes across a variety of genres. Her novels for young adult readers, May Day Mine and Jilda’s Ark are published by Harmony Ink Press, US, and her chapter books for 8 to 12 year olds, Cyclone Christmas and Block City, are published by Sunshine Books, NZ. She is also a published author of short stories, newspaper articles, poetry, and travel articles. She teaches International students at the University of Tasmania in Hobart.